RGS10, 1-181aa, Human, 01-1796-10 | ARP American Research Products, Inc. Regulator of G protein signaling (RGS) family members are regulatory molecules that act as GTPase activating proteins (GAPs) for G alpha subunits of heterotrimeric G proteins. RGS proteins are able to deactivate G protein subunits of the Gi alpha, Go alpha and Gq alpha subtypes. They drive G proteins into their inactive GDP-bound forms. Regulator of G protein signaling 10(RGS10) belongs to this family. All RGS proteins share a conserved 120-amino acid sequence termed the RGS domain. 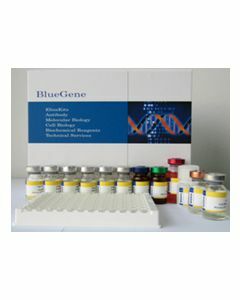 This protein associates specifically with the activated forms of the two related G-protein subunits, G-alphai3 and G-alphaz but fails to interact with the structurally and functionally distinct G-alpha subunits. RGS10 protein is localized in the nucleus. Recombinant human RGS10 protein, fused to His-tag at N-terminus, was expressed in E.coli and purified by using conventional chromatography techniques. Cali J J., et al. (1992) J Biol Chem. 267:24023-24027. Simon M I., et al. (1991) Science. 252:802-808.